One need not belong to the generation which used post cards / inland letters / covers / telegrams / Greeting cards / money orders / postal orders and the like… for communicating… one may not have waited for the post man to come and deliver the message that you wanted to receive… The post man was once the most respected and known person in any village as people waited for his arrival expectantly everyday. History reveals that it was way back in 1712, Governor Harrison first started a Company Postal Service in Madras to carry mail to Bengal by dak runner. Decades later the postal rules were in place ~ Chennai General Post Office was initially opened in Fort St. George Square, just outside the Sea Gate, on 1 June 1786. Quite unfortunate that I don’t have the exact date on which ‘Parthasarathi Koil PO’ was inaugurated. A search on Sulekha pages would reveal hundreds of them …………. Adambakkam PO; Adyar PO; Alandur PO; Alwarthirunagar PO; Ambattur PO; Aminjikarai PO; Annanagar PO; Annasalai PO; Mylapore PO; Mandaveli PO; Sholinganallur PO; Sowcarpet PO; T Nagar South PO; Tambaram PO; Taramani PO; Triplicane PO; West Mambalam PO ……….. simply there could be hundreds of post offices but to those residents of Triplicane – the building that housed Thiruvallikkeni Thapal Nilayam is a monument and many would have green stories kindling nostalgia.….the one that functioned at Big Street, Triplicane was known as ‘Sri Parthasarathi Koil Post Office’ ….. only one of its genre named not after the locality but after our presiding deity Sri Parthasarathi. The building housing the Post Office in Big Street became dilapidated, was demolished and now has become a car park. The PO was later housed in a smaller, old building in Hanumantharayan Kovil Street off Kairavini Pushkarini, the temple tank. It certainly was not a proper accommodation ~ leaked during rainy days and after days of difficulty, moved to the premises of Triplicane PO in Triplicane High Road, functioning as a small unit. People of Triplicane, including pensioners and others have been representing for revival of Sri Parthasarathi Swami Post Office and there have been various reports that the building in Car Street, newly built as staff quarters for Thirukoil staff was to have a Nationalised Bank in its first floor and the Post Office from the ground floor. Many representations have been made by the recipients and there has been news every now and then that it is pending with one Dept or the other. Today ‘The Hindu’ Chennai edition carried this report, which truly represents the wishes of hundreds of Senior citizens of Thiruvallikkeni. Many thanks to the Hindu and its reporter for this nice report. The report is reproduced in its entirety below. 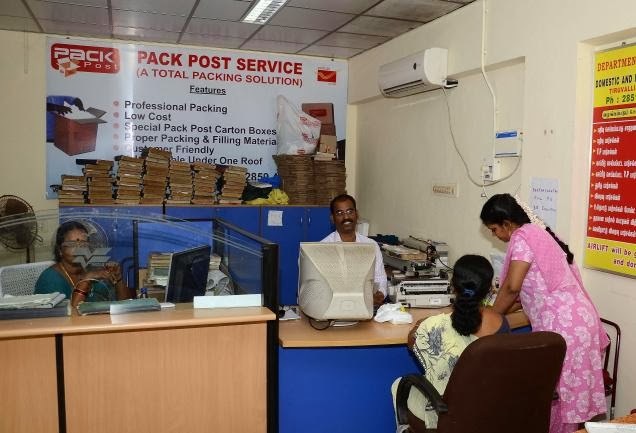 Eight months after a new building was allotted for the Parthasarathy Koil post office, residents of Triplicane are asking why the establishment has not yet begun operations here. Nearly a hundred years old, this post office has a resonance among these residents, 1,260 of whom are part of a signature campaign that wants it to function in its new space. The signatories have now made a representation to the Chief Minister’s cell. Residents said the post office was patronised by nearly 25,000 people and that the establishment managed the savings accounts of around 1,000 people, most of them seniors. R. Viswanathan, a resident, said the post office had been functioning out of the Triplicane post office on Triplicane High Road for the last two years, for want of premises of its own. S. Rama Rao, another resident, said that most senior citizens who used the post office walked an additional 2 km to carry out transactions, due to this arrangement. “We have been waging a battle for the new post office on Car Street for nearly two years now,” he said. Residents said that though the postal department was prepared to pay the rent for the new building, which is owned by the Hindu Religious and Charitable Endowments department (HR and CE), a tussle between these two departments had delayed the process. The HR and CE department has demanded a deposit for the 506 sq.ft. premises, but the postal department has refused to pay the amount, saying this would amount to a violation of departmental rules, residents said. T.J. Ramani, another resident, said that people of Triplicane also attempted to collect money to pay the deposit. But this initiative did not find favour with either department. Residents recalled that the post office got its name as it was first housed in a building owned by temple authorities on Big Street. In 2004, it was shifted to a building on Hanumantharayan Koil Street after the earlier structure became dilapidated. In 2010, the post office was once again shifted to the premises of the Triplicane post office. In their petition, residents have requested the State government to ensure a relaxation on the payment of the deposit and inaugurate the post office as soon as possible.